PRODUCT DESCRIPTION: These are two of the finest lice comb kits available to help remove nits and lice from hair. 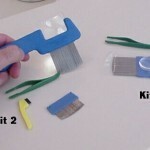 KIT 1: This kit includes a metal tooth comb which will work on all kinds of hair quite well. The comb is made of metal so that it can be sterilized following use to insure it does not harbor nits. The kit also includes a 5X magnifying glass used to help see nits and lice along with a pair of tweezers for lice removal. There is also a cleaning brush included. 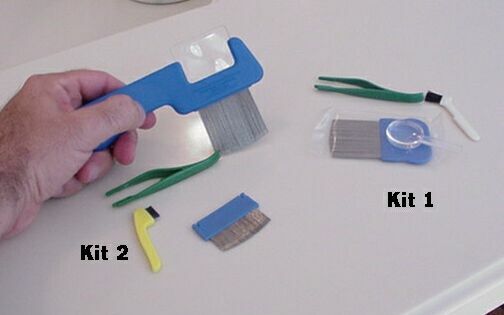 KIT 2: This kit includes all the listed items Kit 1 has; the tweezers, the magnifying glass and the cleaning brush. This kit comes with 2 brushes – both a short and a long tooth version – which insures good use on all types of hair. The other nice feature of this kit is a handle which first serves as a mount for both the magnifying glass and the combs as well as a storage for the tweezers, the magnifying glass and the cleaning brush.